It's my favorite time of year, my prediction of the marketing trends to watch in 2019! With only one quarter left of the year, it becomes pretty clear which parts of marketing are going to take off in 2019 and share how you can take advantage of them.Interested in what your marketing strategy should include in 2019? Let's get into it! If you've been on social media for a while, you'll remember the days of the 6 second Vine video and how it triggered (along with YouTube) video marketing into the trends of 2014 and 2015. It became so popular that Instagram initiated short 15 second videos for users just to stay competitive. Video has continued to remain a stronghold in marketing. YouTube boosts your SEO, Instagram has 60 second videos in the newsfeed and 15 second videos in stories as well as IGTV to compete with YouTube, Facebook has stories, video uploads, and live videos - and all of this is just the tip of the iceberg! Now short videos, around 10 seconds, are back as a stronghold in advertising. 10 second videos with sound and captions are going to take over advertising, keeping the short attention span of ad viewers to capture them as leads. 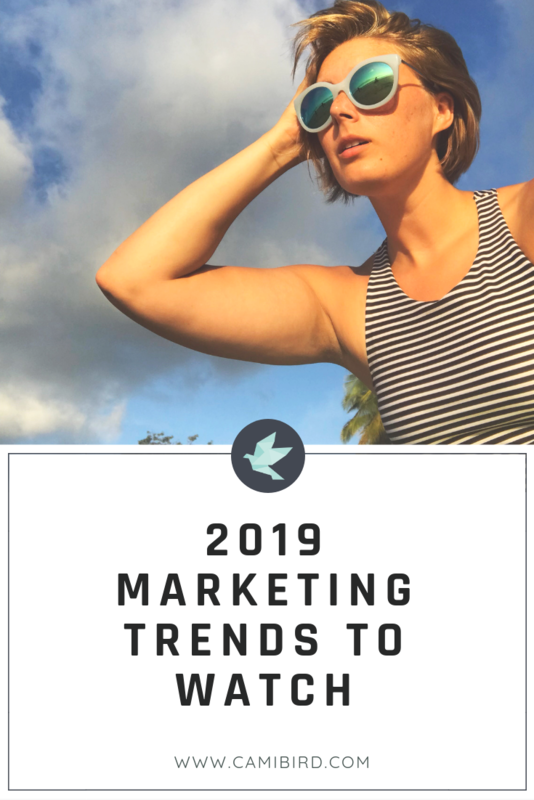 My favorite trend of 2019 is the one I can help you with (so of course I love it) - it's connecting with your audience automatically through messaging. For me, it's specific to Facebook messaging (and hopefully Instagram coming shortly). You can do this yourself connecting your Facebook Page to a software like ManyChat where you can send newsletters (what they call "Broadcasts"), put contacts into autoresponder series ("sequences") and connect through Flows (a variation of funnels). The language might be different than you're used to, but you can pick it up real fast. The hardest part about chatbots is knowing what to include in them and how to truly take advantage of them. That's where I come in! Using a pre-made template takes a huge part of that learning curve out of the equation. When you purchase a chatbot template from me, you also get a quick set-up guide so you can start using it in just 10 minutes! Get started with your chatbot today! One of my most irritating trends (you don't have to like them for them to show up, I'm looking at you tiny sunglasses) of 2019 will be the continued rise of social media influencers. Shifting social media from sharing with friends and families to checking out what the latest "cool" person is up to. Maybe it's the terribly indie person inside of me, but following the cool kids to try and be cool myself has always rubbed me the wrong way. Additionally, I hate to be told what I should be doing from someone with no expertise in the actually field. So how can you take advantage of this trend yourself? If you want to become an influencer, power to you, it will build your audience for your business. But please do it with actual expertise in an area and not "faking it until you make it." Be authentic, genuine, and consistent so you won't be just another "cool kid" but someone worth following. TF-IDF (term frequency–inverse document frequency), has been around for years, but in 2019 it's going to jump to its place in the limelight. TF-IDF, let's call word frequency in content (or WFC) allows you to grow your audience and improve your SEO impact. In simple terms it compares the frequency of certain words in your content and gives recommendations in how to improve the related keywords used. This strategy is killer when combined with regular SEO efforts because Google now focuses on quality of content, variations in terms and not the frequency of one term. In short, focus on a topic and related pieces of that topic using SEO and WFC, using this strategy will hyper focus your writing and improve your reach. Do you think I missed a marketing trend for 2019? Let me know in the comments below!